Located in Jl. Sersan Bajuri, Graha Puspa Complex , Cihideung, Lembang, Bandung, West Java, Indonesia. One appeal of Sapulidi Resto and Cafe is you can dine in the gazebo on top of rice fields like farmers in the village. Saung made somewhat higher than resemble bamboo and thatched huts stage. You need to go up some stairs from wood to sit cross-legged in these huts. While at the bottom is the grassy ground and in addition there saung (Gazebo) rice plots. To add to the impression you’re in the field, there is a scarecrow that is commonly used by farmers to repel birds. Roads to the huts resemble rice field with a small width of the ground. Left and right side of this dike is rice plots. At the edge, a small stream of water flowing like a stream of irrigation in rice fields. Servants also performed using traditional clothing. To use the female waitress kebaya as well as the manservant who use traditional clothing. You can feel the dining atmosphere at the side of the fish pond. With huts made of wood above the goldfish pond.The Bamboo – Dine – in Gazebo dining atmosphere is different than eating at Saung because here, you do not eat it sitting on the floor, but sitting on a chair. Eating here also can not separate as many tables in this cottage, in contrast to Saung for small groups. This is one more reason many choose to eat on saung while looking rice plots. The visitors, especially children love to ride a boat that is in the goldfish pond. Visitors can paddle canoe while looking goldfish that is in the water. Quite a lot of carp in the pond and the rather large size. Just not too extensive existing pool near this timber cottage. From eating places in the form of huts, there is a door that connects with Sapulidi Resort, indeed provide a place to stay in the form of traditionally designed cottages. With wooden doors gebyok traditional Javanese be the entrance into the room. 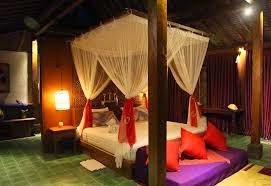 In the cottages, bed with mosquito net, a table, chairs and a simple wooden floor make you feel living in the village. Not to mention, a tiled bathroom natural stones are made in harmony with the natural feel of the entire cottage. Washtafel of stone with a tap of bamboo or form like a shower. In certain types of cottages, there is a bathtub made of stone. The environment around the resort with vegetation, footpath, traditional cottages and lake can make you feel a different atmosphere. 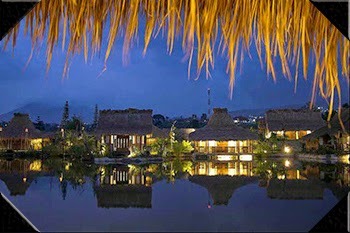 Existing lake resort can also be used by visitors to the Sapulidi Restaurant. Of course, if it is not being used by other visitors or guests who stay at the resort, there are only two canoes in the lake and the lake is much larger than the existing pond on where to eat. Boating on the lake, you can enjoy the calm water lake surrounded cottages traditional design. Unique names in Sundanese of diet you can try. For example, Fish Residents of Sapulidi, fly to the Moon Chicken, Smoke Chicken, Pounding Calamari, and other menus. For food prices ranging from IDR. 10,000, – to IDR. 52,000, -. You can also taste local drinks offered broom. Beverages ranging from juices, soft drinks to traditional drinks like sekoteng and warm wedang ronde (Ginger drink). The drink menu ranging from IDR. 3,500, – to IDR. 35,000, -. Before leaving the spot, you can stop at a souvenir shop. There is a wide assortment of items that you can make a souvenir. Start of food such as chips and other snacks. Various accessories attractive woman can have, such as bracelets, rings or necklaces of beads and of rocks. Souvenirs unique and distinctive is preferably a miniature bicycle, rickshaw and miniatures bicycle rickshaws. In addition, there are also shirts, shoes, bags and various crafts that can be gifts for friends or relatives.